Laurence Meyer was born and grew up in France, and has been living abroad for the past 20 years. 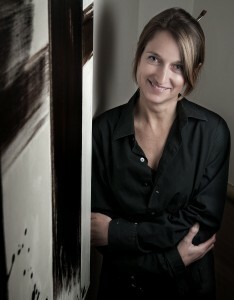 She has lived in Germany, New York, Singapore, Tokyo and currently resides in Milano. The artist decided to focus on visual arts after arriving in Singapore in 2005, where she joined the painting group of Singaporean artist Chuyia Chia. Laurence Meyer now paints mainly abstract works, in oils and mixed media. Laurence also paints for and with children, whom she finds an endless source of inspiration. She is working and paint in her free time.